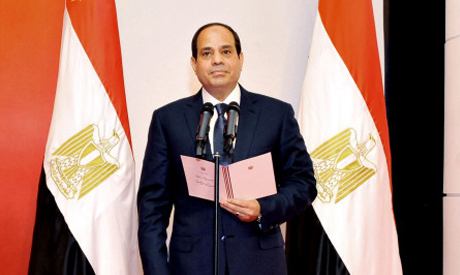 Abdel-Fattah El-Sisi has been sworn in as the eighth president of Egypt at a ceremony in Cairo. He took the presidential oath at the Supreme Constitutional Court at an event attended by former interim president Adly Mansour, Prime Minister Ibrahim Mahlab, Al-Azhar Grand Imam Ahmed El-Tayib and Coptic Orthodox Pope Tawdaros II. The ceremony started with verses from the Quran followed by short speeches by head of the constituitional court Maher Samy and its charges d'affaires Anwar Assay. The inauguration will continue on Sunday afternoon with ceremonies at the Ittihadiya and El-Kobbeh presidential palaces, which will be attended by foreign representatives and Egyptian public figures. The former army chief won a landslide in the 26-28 May presidential election, gaining almost 97 percent of the vote. Mohamed Morsi was the first Egyptian president to be sworn in at the Supreme Constitutional Court. Morsi, who was ousted by the army amid mass protests in July 2013, swore the presidential oath in Tahrir Square among thousands of supporters, then at the court and finally at a ceremony attended by public figures and foreign guests at Cairo University. They are still defending the Brotherhood in defense of democracy ,and they are still talking about what happened on 30 June,2013 as a coup. To call a theocracy democracy is a clear contradiction in terms. And to call the execution of the will of 33 million Egyptians a 'coup' inexplicable, to put it mildly. We know quite well that only 9% of the people voted for him. We also know that this regime is based on lies and falsification of facts. That is why he will fail, sooner than many people think. Do you have proof that only 9% voted for Sisi or is this more delusional MB propaganda? Wake up and re-join Earth. Our dream President El Sisi is an excellent manager who taps into talents and resources in order to support and bring out the best in others. He is An outstanding manager Who evokes possibility in others. What a drama ? Mubarack.... Omer Sulayman.....Thanthavi....now Al-Sisi .....Very good . But people ???????? Future of Egypt. ?????? What a disgusting and scary creature. He will not succeed in destroying Egypt however. They will not go back to being ruled by a military strongman. Amr mousa was smart to leave. No freedoms in Egypt anymore. Even the liberals are arrested and hunted. What a catastrophe.